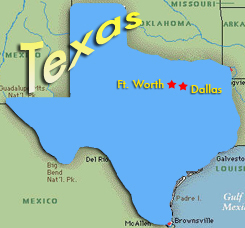 The Dallas Fort Worth Marine Aquarium Society had a very humble beginning but is now one of the largest marine societies in North America almost 20 years later. We have a strong membership base that grows regularly and actively participates in our many club-sponsored activities and events. Our club has regular monthly meetings, bi-annual swaps and socials, different workshops and special engagements, as well as our annual conference, known as Next Wave. Aside from the different community events, our members have access to many different programs such as our Library, Coral Cooperative and Scholarship offering as well as fun interactive outlets like photo of the month and tank of the month. Our information rich website hosts a forum where members can post and read information about the hobby and their own systems, browse and submit photos into the gallery and read the club newsletters. We are lucky to have the support of almost two dozen local and out of state sponsors that enable us to offer great benefits to our members. 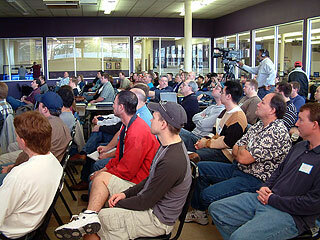 By 2002 we had gained non-profit status as well as our incorporation and went on to successfully host MACNA XIV, proving that such a gathering could not only be profitable for host clubs, but would also provide the attendees and lovers of this hobby with something bigger to look forward to every year. Our club consists of regular and junior members of all ages, some as young as 7 years old, that are led by a Board of Directors elected through popular vote by the general membership. Our annual dues are $20 per person, and we are proud to say this fee has only increased once from its original $15 annual amount in 1992. 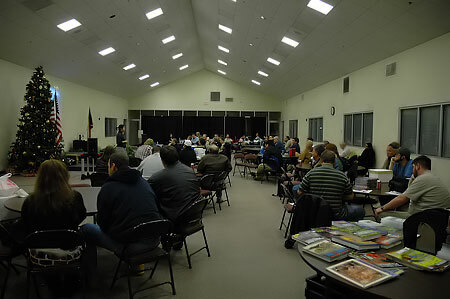 Currently there are almost 600 paid members and nearly 3,000 who actively participate on our club’s website and forum. 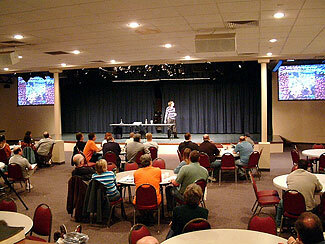 We have regular monthly meetings with drinks and snacks, and an educational presentation on the second Wednesday of every month. 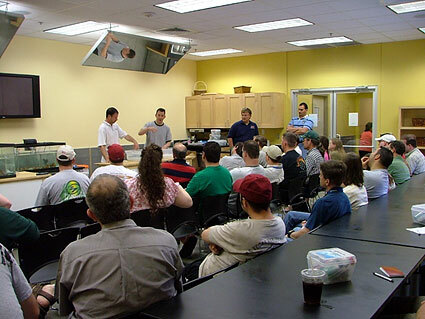 We rent out a large conference room in Grapevine with a sales area and a kitchen that allows us the perfect environment for the social interactions that our previous members’ homes or store settings used to provide before the club grew to its current size. 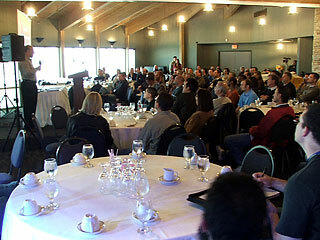 All participating club members, and often their guests, benefit from the strength this club now has. Hard work and dedication allows several events and programs to be offered from simple cookouts to all day social and education exposés. DFWMAS places an emphasis equally on these two aspects that can make this hobby truly enjoyable. 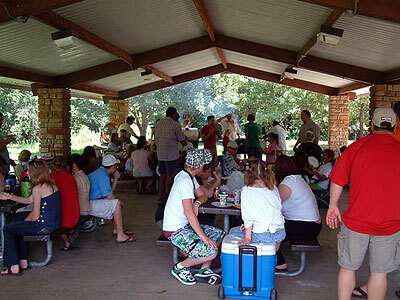 Cookouts and your basic everyday social helps to bring hobbyists and families together while our educational workshops and conferences bring the memberships marine knowledge up. 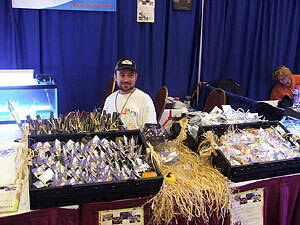 DFWMAS Day is another way we promote the club to local hobbyists. Several Tank Tours occur each year allowing the members the opportunity to enjoy each other's hard work and interact on a personal level, providing both ideas and guidance in a hands-on way. Our next largest event has recently become a combination of two smaller activities and is again one which we invite members and their family to come for the day. The Summer Social and Frag Swap is a time for coral trading and a cook-out that works to bring together people from our vast metroplex. 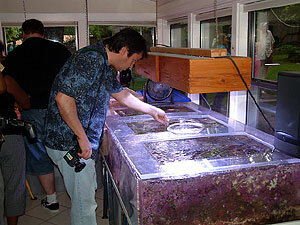 It is a time of learning and talking about growing out the propagated coral population of our area. We hold our second raffle at this event and normally have an excellent turnout, plus participation from our great sponsors makes it even better. We offer a second frag swap later in the year as encouraging propagation furthers our mission. One of our smaller events held for this cause are Propagation Workshops which help to teach the best ways to make, care for, and handle frags of our magnificent corals. 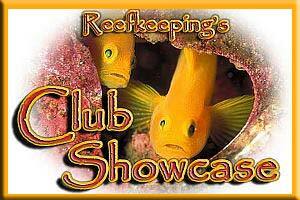 DFWMAS tries to encourage coral trading and captive propagation through another club sponsored venue we call the Coop. Through this program, as we have seen great successes with sister clubs, is a way for members to trade and swap corals grown in their home tanks, further limiting our effect on wild coral species taken from our oceans. The club hosts a forum section and a soon to come software application to help track lineage and trading, both for accountability and so we can see what does well. We hope to see this program grow in popularity, as well as spread amongst clubs near and far away, so that our hobby can be self-sustaining at some point down the road. Besides the hosting of the Coop on the website, we have several specific features dedicated to making the life of fellow hobbyists better. The primary tool is our forum where we have over 400,000 articles posted on everything from Beginner topics and simple Q&A threads to advanced reefing theory and tests and trials discussions. We have information and help available any time its needed right at everyone’s fingertips. 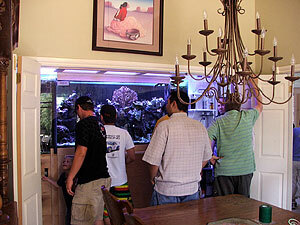 Easily accessed from there we offer an image gallery, local fish store locator, and quick links to information about the club. For regular updates on what is going on in the club, member and hobby news we also archive our monthly newsletters, the collaborative effort of our President, Communications Chair, and fellow club members, of whom we are very proud. 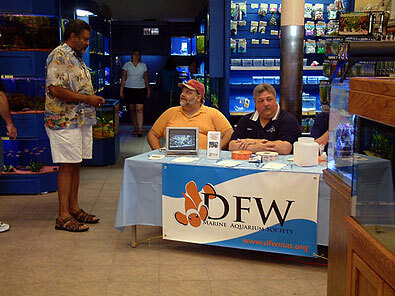 The Dallas Fort Worth Marine Aquarium Society is always working to better things for our club, and this year is not going to be any different. 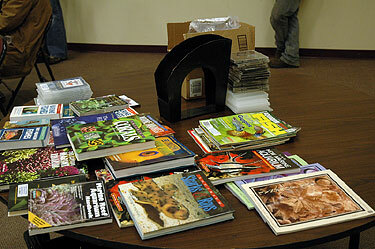 A primary educational tool we provide to members is the use of books, magazines, and DVD's from our club-owned library which we have committed a significant amount of resources to in the coming months to add the latest and greatest items. Another big step currently under way is increasing the load capacity of our website, seeing how we support many thousands of people on it annually. Before we do this we are also giving the site a full update which should be live shortly. Our membership is steadily growing, and while these few things will help to provide more to the ever increasing base we are continually looking for things we can do to make the club better and accommodate as many as possible. 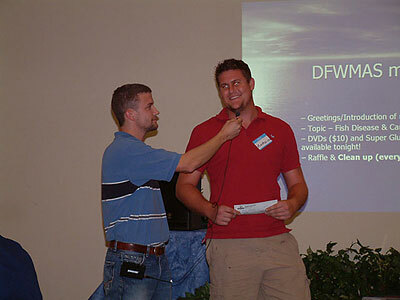 We encourage you to visit our website at http://www.DFWMAS.org today and see what is coming up next!